First impression | The Vauxhall Meriva was launched in the spring of 2010. Compared to other family cars, the Meriva distinguished itself by offering a more flexible use of the available cabin space. Also, road handling and technology were above average. Yet, its rivals kept improving their vehicles, so now the Meriva was ready for a facelift. Vauxhall focussed on three areas when improving the Meriva: engines, gearboxes and satnav. Since those are all under the skin, Vauxhall also tweaked the looks of the car to make clear that this is indeed the new and improved Meriva. 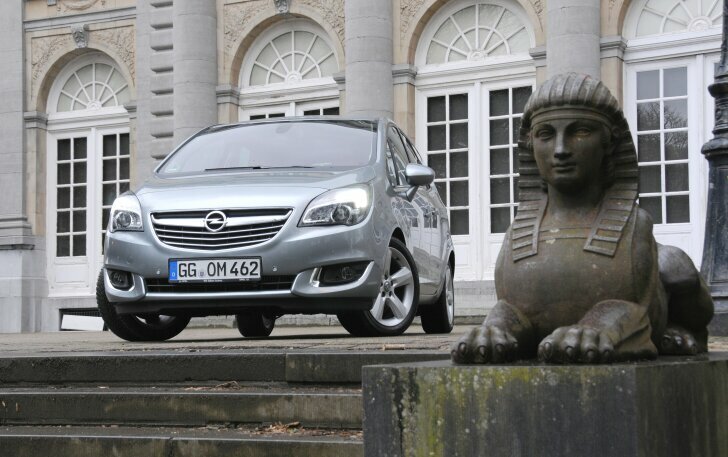 The 2014 Meriva can be recognised by a new grille and new side lights. They make the car look less cheesy and more confident. A chrome strip just beneath the side windows emphasises the shape of the car. Do take notice of the little "jump" in the curve below the rear side windows. This makes it easier for small children to look outside and that's a great asset for a car like this. The tail lights now make use of LED technology, which is more reliable and more energy efficient than old-fashioned bulbs. 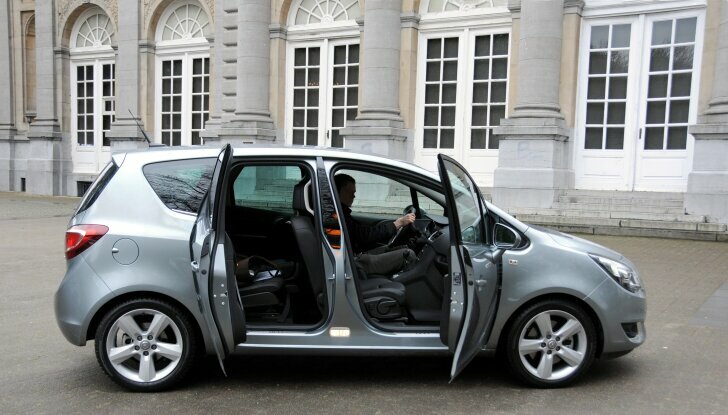 Vauxhall calls the Meriva its "flexibility champion" because the cabin space can be used in many ways. For example, there's a rail between the front seats on which various storage boxes can be attached and moved around. This rail no longer extends to the rear seats. According to Vauxhall, owners did not appreciate this because it split the back seat into two parts. As usual, the rear seat can be adjusted in many ways. The most interesting of which is the "lounge" set-up, where the seats move forward and outward (because the wheel arches no longer restrict the width). Absolutely unique for Vauxhall is "FlexFix": a bicycle carrier that's integrated in the rear bumper which can easily be moved in and out. Parking the car is now easier thanks to the optional rear-view camera. 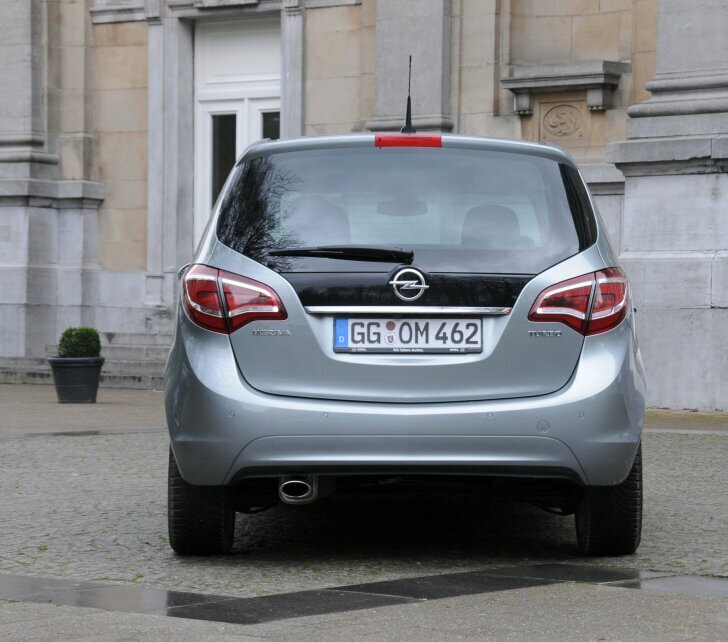 While the Meriva is a tad larger than its main rivals, the cabin space isn't much larger. The biggest plus is the ability to flexibly arrange the cabin space. The rear doors pivot in the opposite direction of the front doors (at an angle up to 87 degrees), allowing for easier access. Seated behind the steering wheel, it is clearly noticeable that the driver sits up higher than in other MPVs (Multi Purpose Vehicles). When opting for the "ergonomical" chairs (developed in cooperation with the German institute for healthy backs) the driver and co-driver sit like royalty! The 2014 Meriva features a new audio and navigation unit named "IntelliLink". Vauxhall raves about this system, claiming that it perfectly integrates any smartphone with the car. In fact, the functionality doesn't differ from similar systems from other brands. Both iPhone (cable or Bluetooth) and Android phones (only Bluetooth) can easily be connected. Besides the possibility of making hands-free phone calls, the system can read text messages outloud and music stored on the phone can be played over the car's loudspeakers. There's one function that's less common: all Bluetooth driven voice commands can be passed through to the phone; this means services like Siri can be used while driving. The satnav has hardly been improved at all. In complex situations still no schematic overview is shown, in fact the system simply zooms in on the map. Vauxhall says zooming in and out is much smoother than before, but it still isn't as good as a smartphone would do. Another missed opportunity: the instructions of the navigation system are not shown in the display between the speedometer and the rev counter. The Vauxhall Meriva is taller and heavier than a traditional car. Yet, the Meriva handles as well as a normal car. This is thanks to firm suspension, which still offers sufficient comfort when required. Rightfully so, Vauxhall didn't change a single part of the underpinning for this renewed model. The biggest news for the new model year is the introduction of an all-new diesel engine. The existing 1.3 and 1.7 litre engines will both be replaced by a single 1.6 litre diesel. It is stronger than the old 1.7 litre and yet more frugal than the 1.3. At first, the most noticeable difference is the quiet and smooth run of the new engine. For this test the "1.6 CDTi" which develops 136 PS / 320 Nm was tested. Since this power is available even at low revs, it doesn't really matter which gear has been engaged; the Meriva will perform anyway. Some will describe this as boring, others will experience this as comfortable and relaxing to drive. According to factory figures the new 1.6 CDTi consumes 4.4 litres of diesel oil per 100 km (64 mpg). In real life it is hard to achieve this. Even when going particularly slow, 5 litres per 100 km (56 mpg) was the best possible mileage. Expect at least 6 litres per 100 km (47 mpg) when speeding up. At the moment of writing an extra frugal version of the new 1.6 CDTi is being developed, which, thanks to a more efficient engine management system and several aerodynamic improvements, is supposed to be more frugal. The 1.4 litre petrol engine (available with and without a turbo) has not been improved for 2014. Still, it is more efficient thanks to a new gearbox. Internal friction has been decreased, thereby improving fuel efficiency and making it easier to change gears. 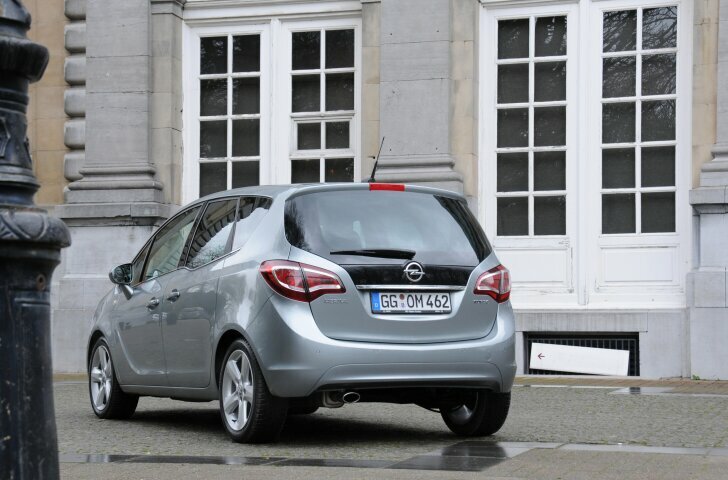 During the first test drive the editor noticed that Meriva's clutch was tricky to operate; this has been solved with this new generation. Those who prefer the computer to shift gears for them can now combine the 1.4 litre turbo engine with an automatic gearbox. It is a traditional six-speed automatic, no double clutch or other innovative technology here. This is why the automatic uses far more fuel than the manual 1.4 turbo engine. On the otherhand, the automatic gearbox does do its job as it should: it shifts gears unnoticably and makes life easier for the driver. The Vauxhall Meriva has been updated for model year 2014. All the strong points are still there. While the Meriva isn't more spacious than similar cars from other brands, it is easier to access and the cabin space can be arranged more flexibly. On top of that, handling is above average as well. The biggest improvement for 2014 is the new audio and satnav unit, which now integrates with mobile phones better than before. The new 1.6 CDTi diesel engine is more furgal, stronger and much quieter than before. Thanks to new gearboxes, all engines are now more efficient. Finally, the petrol powered Meriva is now available with an automatic gearbox.